Born in Clarksburg, West Virginia, Patty Weaver was raised in Dayton, Ohio. She knew early on that performing was her dream. In fact, she delved into singing before launching her acting career by forming the rock ‘n’ roll band, The Loved Ones. Weaver began her television career with appearances on the sitcoms MAUDE and ALL IN THE FAMILY. 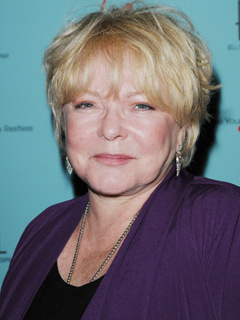 She got her big break when she was cast as Trish Clayton on DAYS OF OUR LIVES in 1974, a role she held through 1982. Upon leaving the NBC show, she quickly landed another soap, YOUNG AND RESTLESS, when she was cast as restaurant owner Gina Roma. Weaver has continued her singing career over the years, performing on the nightclub circuit and recording several albums. She has been a regular on several prominent telethons and helped raised millions for charity. Weaver is a petite 5' tall. She once worked as an associate producer for Channel 9 in Los Angeles. After legendary producer Norman Lear happened upon Weaver and a friend singing and performing a skit, he presented them with a script to appear on ALL IN THE FAMILY. Weaver credits never talking about work; namely, YOUNG AND RESTLESS, as the secret to her and late husband Jerry Birn's happy marriage. The actress lives in Southern California. It isn't easy when marriage partners work and play together, but Y&R's Patty Weaver (Gina) and writer Jerry Birn have it down.